Win a $75 Gift Certificate to I Dream of Falafel! Congratulations to Linda Voss on winning our ninety-third High Five Giveaway and thank you to all who entered! 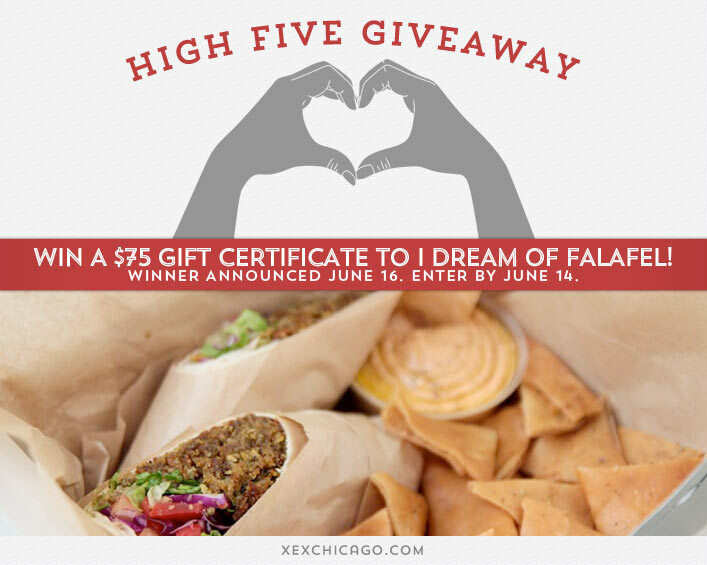 Our next High Five Giveaway is for a $75 gift certificate to I Dream of Falafel. At I Dream of Falafel, they have created a unique concept of combining fresh, local, healthy ingredients to prepare delicious Mediterranean cuisine with great, quick service and at a price that is just right. The food is prepared daily with the highest quality of fresh ingredients and is customizable to suit your dietary needs and taste buds. Their menu has something for everyone (vegan, gluten-free, low-fat, low carb, high protein) and provides a variety of slow cooked meats and vegetarian selections with an impressive level of taste you’ll be dreaming about. I Dream of Falafel has 4 locations in the Chicago area with one at 112 W. Monroe and one at 555 W. Monroe. Visit their website at www.idreamoffalafel.com or call them at 312.263.IDOF for more information. We’re getting excited about summer in Chicago! What are you looking forward to the most this summer? Now, just add a comment to this post with the right answer to be eligible to win! The winner will be announced on Monday, June 16. Entries must be received by midnight on Saturday, June 14. Good luck! All individuals 21 and older are eligible, whether you are a client of XEX or not. Must be able to pick up the gift certificate at XEX, 35 West Wacker Drive, Chicago. Leaving a comment opts you in for the XEX email list, which is sent out 1-2 times per month. You may unsubscribe at any time. Winner must be able to pick up gift certificate at XEX within 30 days. all the street fests and concerts! Longer days of sun, fun and spending time with family and friends!! All the wonderful art fairs! Spending some time with my wonderful daughter and new son-in-law! Seeing some up and coming musicians perform at some local dive bars. the absence of snow… finally! Warm weather, running, movies in the park! So happy to be moving back to Chicago just in time for beautiful summer days spent with family and friends!!! Summer Days! My company gives us one day off per summer month to just do as we please! Can’t wait to take advantage of those days off and enjoy the Chicago sun! Getting my hair cut at XEX! High ponytails and flip flops! I’m looking forward to swimming pools, cookouts, cold drinks & tanning outdoors! Summer festivals, rooftops, and the lake! Sundresses, flip flops, walking to work, dining al fresco…the good life! Longer days + shorter nights!